Premium, hand-crafted, the Sudio Vasa Bla is an excellent in-ear Bluetooth headset that sounds as good as it looks. iPhone 7 users, this is THE headset you should definitely have at the top of your shortlist of wireless headsets to get. With 3.5mm audio jacks going the way of the dodo, one definitely has to look forward to the options available. We have all kinds of technologies to achieve that but the most popular wireless audio technology by far is Bluetooth, since almost every recent device will feature a Bluetooth radio. Today we have the Sudio Vasa Bla here, a premium Bluetooth wireless headset that I have used daily for almost two weeks by now. We got the Sudio Vasa Bla in a gift package. Real Christmassy look and all. If you are getting it for someone, make sure to tick the checkbox to get it in a premium gift box. If you are getting it for yourself, just skip to the next image. Aside from the standard packaging in the gift box, you get a little note so the recipient knows who sent them such a nice gift. And this is the standard packaging. On the front, you get a product image of the Sudio Vasa Bla and the branding on a clean white background. As you can see here, we have the Rose Gold Black variant with us. Over on the back you can find out all the packaging contents as well as most of the necessary specifications like battery life and charging time. The front lid is held by magnets along the right edge of the packaging. Undo them and the lid flips open, revealing two little boxes. A UV printed glossy logo is on the inner side of the lid. Sudio paid a lot of attention here in the packaging, and we definitely hope to find the same level of attention to detail in the product itself. Along with the Sudio Vasa Bla, you get a leather pouch, four different sized eartips, cable clip, the usual quick start guide and multi-lingual user manual, and a super classy guarantee certificate that is an actual plastic card with the serial number of your unit embossed into it. You know that you are really getting something premium. 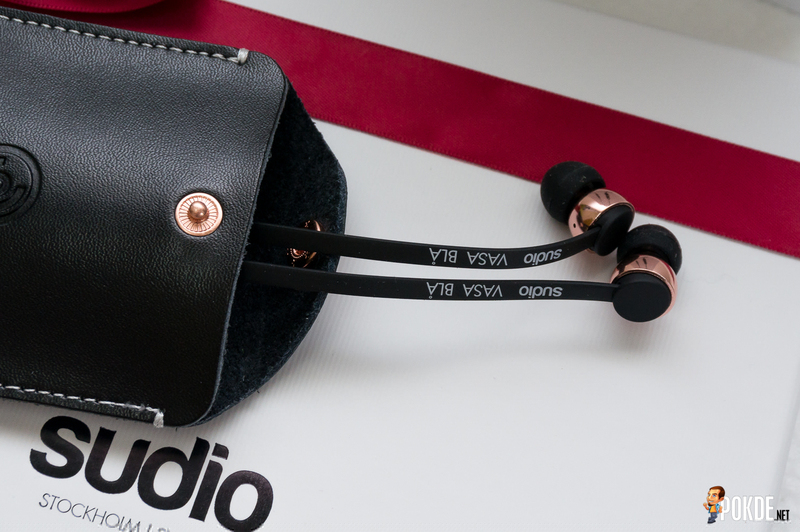 The Sudio Vasa Bla features a cable connecting the two earpiece to each other, with the battery and remote on opposing ends. Everything other than the aluminium earpieces are finished in a very nice soft-touch coating. Let’s take a closer look at the earpieces. Made of rather thick aluminium finished in polished rose gold, they feel really premium to the touch while not adding to the weight. Silicon tips are on one end while the outer end is plastic with the soft touch coating. The black cable connecting the two earpieces is flat, with the product branding on the outer surface and the R and L labels on the inner surface. Actually, the indicators are not that necessary since we have the battery and remote on each of the sides to easily differentiate which side is which. The battery will be on the left side. The rectangular block feels nice to touch, with a small rubber flip door which reveals the microUSB port to charge the Sudio Vasa Bla. The door lies flush when closed despite its soft material, which is nice to see. Over on the right we have the three button remote. It looks decidedly plasticky, and seems slightly out of place on such a premium piece of earphone. I wish Sudio had gone with a remote similar to the one the standard Vasa has. A discreet indicator LED is hidden above the + button, but is definitely a lot less discreet when in use. It flashes blue when active, switching to red on certain occasions, i.e. when pairing with a new device. Connecting the Sudio Vasa Bla to your smartphone or computer is very easy. Just hold down the middle button for 7 seconds until the indicator LED blinks red and it is ready to pair with your device. Audio should be pumped out of the Sudio Vasa Bla automatically after pairing. As usual for in-ear headsets, comfort is a matter of finding the right tip. With Sudio including 4 sizes for you to choose from, it isn’t a problem at all to find the one that suits you best. As I have differently sized ear canals, I switched around until I found a pair that allowed the earpieces to sit in my ear properly. I wear it with the cable hanging behind my neck, which allows the weight of the battery and earpiece to rest on the back of my neck. The weight is really insignificant, making it very comfortable to wear for extended periods while out and about. One of the benefits of having a cable is that it will be more secured, and less weight will rest in your ears. As AirPod users may know, there are actually third-party accessories to link the two earpieces just so that you will not run the risk of having one side drop out and you having to buy a whole new pair as they aren’t sold separately. Even with the cable, I am glad to find no microphonics even when I use it during brisk walks, as the cable sits very stably on the back of my neck. If you are annoyed by the microphonics of your IEMs, you should look into getting one of these Sudio Vasa Blas, or any wireless headset for that matter. Now that I have gotten comfy with the Sudio Vasa Bla in my ears, let’s turn on the music. Sudio does claim to offer a true studio experience with the Sudio Vasa Bla, and I am truly impressed. I use them with my daily driver, a Honor 8, and the sound quality was just one of the best I have ever experienced out of an IEM. Bass is punchy, yet doesn’t overpower the crystal clear highs. It also avoids the cliched cold sound signature that some headphones tend to have when they aspire for studio-like sound, going instead for a warmer and wholesome sound that definitely sounds way more appealing to my ears. The microphone, which is located on the remote as well, will be located somewhere beside your neck when you wear it with the cable passing behind your neck, but my friend didn’t complain of any difficulty hearing me in a phone call despite the rather weird location of the microphone. The battery life of the Sudio Vasa Bla is great, and Sudio claims 8 hours of music before needing a recharge. I managed to use it for 3 days of infrequent music listening sessions, which is more than good enough for me. It will also turn off automatically after 10 minutes of inactivity to conserve battery. Heavier usage may see it having to be charged daily, but it will definitely last a few days if you only use it for the hour-long listening sessions at the gym or while taking the train home from work. Recharging it is not too bad either, and since it recharges via microUSB, you can use just about any smartphone charger for juice. After using the Sudio Vasa Bla, I realized that I now have the freedom to leave my phone in one place and walk around my small apartment while enjoying music. I never realized the convenience of having such a privilege until I got the Sudio Vasa Bla. Once you experience using wireless headsets, you will also find wires to be cumbersome, so be warned. For RM398, it is quite a lot of money to pay, but if you want a premium, hand-crafted, wireless headset that sounds as good as it looks, the Sudio Vasa Bla makes for a very compelling buy. The Sudio Vasa Bla definitely deserves our Gold Pokdeward. And oh, you don’t have to pay the full RM398. As a token of appreciation for our readers, you can get 15% off your purchase with our exclusive POKDE discount code. Thank you Sudio! AMD is cooking a new chip to fight against the GTX 1050Ti – AMD Radeon RX 465?